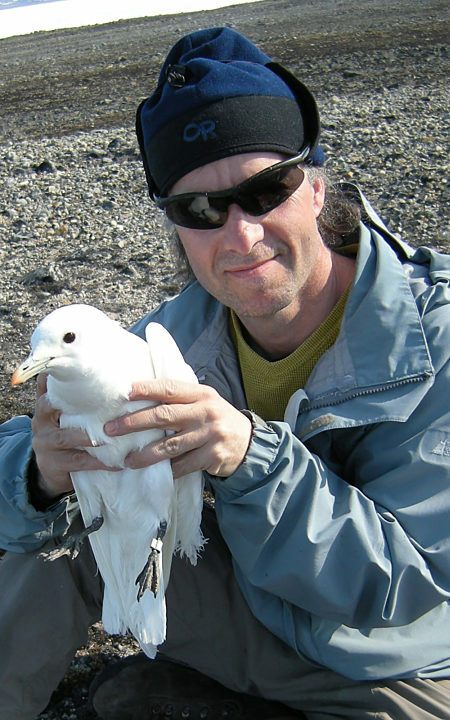 Mark has spent two decades conducting research on Arctic seabirds to better understand climate change, to environmental contaminants, and to evaluate candidate protected areas. Dr. Mark Mallory is a Canada Research Chair in Coastal Wetland Ecosystems at Acadia University, Nova Scotia, where he studies coastlines in the Canadian Maritimes and Arctic. In 1999, after researching effects of acid rain in Ontario, he moved to Iqaluit with his wife Carolyn, and their three children (Conor, Jessamyn and Olivia). There, he worked as a government biologist studying the effects of climate change and pollution on seabirds. Most of Mark’s northern work takes him to the high Arctic, where there are few mosquitoes, little warmth, and lots of pesky polar bears. However, as an international researcher, his collaborations stretch from Alaska to Norway, and he also has extensive research underway in Labrador and Nova Scotia. He has written over 250 scientific papers, as well as the book Common Birds of Nunavut. His research led to the creation of Akpait and Qaqulluit National Wildlife Areas on eastern Baffin Island, and the uplisting of ivory gulls to Endangered status in 2009. He is one of three Canadian members on the Arctic Council CAFF C-bird committee, was appointed to the Royal Society of Canada—College of New Artists, Scholars and Scientists, and was awarded a Fulbright Chair in Arctic Studies at University of Washington, Seattle in 2018. All of this sounds kind of high-brow; mostly, he just enjoys cold and windy places, playing with birds, and convincing Carolyn that birds are more interesting than plants.